The time sure flies doesn’t it? Hard to believe it is the beginning of another new year. This is the time of year that people set new goals for the upcoming year. I’m not one for New Year’s Resolutions. People usually don’t take those seriously, however, I am a firm believer in setting goals and making action plans to achieve those goals. Every year it is a good plan to look back at the previous year and think about different things that have happened up to this point. Reflecting on both the good things that happened and things that weren’t so good. Don’t spend much time on the things that weren’t so good but just enough time to take note of anything that you learned or ways you could get a better outcome. Not only is it important to be regularly analyzing things and improving as we go, it is also important to express Gratitude and celebrate the successes of the previous year. Celebrating is really important because it sets a success energy that attracts more good things. I recommend you use Young Living Gratitude Essential Oil Blend while you are doing this. Gratitude oil has a very abundance attracting energy. 1. We train our subconscious to be aware and open to success and abundance. 2. We give our subconscious and conscious mind PROOF of our success and progress. 3. It builds self-esteem, confidence and belief in our abilities. Any successes large and small. Even the things you consider small. Some of these small successes are stepping stones to larger successes. New things you learned – This is a huge one that people often forget to include. Reflect on all the training you have taken, books you have read, videos & audios and live events you have attended, anything that has been good for growth in your personal development or business skills. Really celebrate this one knowing that training and personal development is the biggest success secret of network marketing professionals who earn full time income. Don’t forget the things you learned by trial and error. Like when you began learning to write a blog or make a video. There are lots of things you can add to your list. I recommend writing down your reflections. If you have been following my training for any length of time, you should have this done from previous years and have saved them. If so, take out some of your past years reflections and look at the progress over the years. This is really fun. Reflecting on the progress you have made builds confidence. When I look back on the early days, when I was afraid to step into the leadership role, I am amazed at how far I have come. Network Marketing is the best business for personal growth and with Young Living we have awesome essential oils that enhance progress in so many ways. After you have finished reflecting on the previous year, you can make a plan of action for the upcoming year. What will you do to increase your business? How will you improve on your marketing skills and what will you do to implement. Think about where you want to be at the end of this year. Write that down. Then make a list of all the things you plan to do to get there. Writing all of this down is very important. It helps you have a direction for the year. Keep a copy of both the reflecting of the previous year and the plan for next year. It is really empowering to look back at the things you have accomplished in the past and how far you have come, especially when you have the notes for several years. You can see your growth over the years which is such a confidence booster. It is also good to reflect on your WHY. Why you are building this business. Click image to make it larger. What is your daily routine like? It is a good idea to step back once in a while and think about what you are doing in your business. Are you really doing things that are productive? Things that actually produce INCOME. If you are like me, you started building your Young Living business because you love the products and you can see the potential income. Whether you want supplemental income or you want full time income, it is important to be doing income producing activities on a DAILY basis. It takes consistent, persistent, DAILY work. If you actually intend to generate income, your daily work must be productive, income producing work. It is all too easy to get caught up in time wasting “busy work” that really doesn’t do anything to grow your Young Living business. Too much time on Facebook checking and updating your Facebook status. Talking to the same prospects over and over instead of looking for new prospects. All of these things are important but they must be focused. Checking email a couple times a day is important but not obsessively. Facebook is a powerful business tool but it can be easy to get drawn down a rabbit hole following links. Studying the products is important but it doesn’t generate income unless you are sharing the info with people. Your website and contact info should be on EVERYTHING you hand out. Building Your List – This is an ongoing process. You should always work to grow your list. If you have a blog or a newsletter, you want to grow your list of subscribers. If you have a Facebook Business Page, and you should, you should be growing your list of followers. Your list is a powerful business asset. You must be regularly adding value to the people on your list. Whether email newsletter, snail mail, blog post or Facebook Page, share VALUE: oil tips, recipes and things they will benefit from. Not spamming with your signup link. Value posts will keep them coming back and eventually sign up. I have had people sign up after getting my newsletter for months or even years. There are lots of income producing activities you can do every day. The important thing is to have a plan and focus on getting several top income producing activities done EVERY DAY. Are You Building Your Young Living Business Part Time or In Your Spare Time? How are you building your business? Most of us start out building our business around other things we are doing. That’s the way I started my Young Living career nearly 20 years ago. I saw the potential for working from home and freedom both time and financially. If you are like me, and had to start building your business around a job, you will need to build your Young Living business part time. There is something very important you need to keep in mind. The way you approach your business will determine whether or not you are successful. There is a big difference between part time and spare time. If you are building your business in your spare time you will NOT be successful. It’s as simple as that. When you build your business in spare time, you are putting it’s importance in last place. There will always be things that crowd out the daily tasks. Things just don’t get done. Maybe once in a while you dabble at your business but nothing that is consistent and making forward progress. If you want to seriously earn an income in with your Young Living business, you MUST get rid of the SPARE TIME approach to building your business. The spare time marketer does the business once in a while when they have some extra time. A strong business is not built that way. Building your business part time means that you have a schedule. When you have a part time job, you have certain hours you devote to your job. You show up and do the work on schedule. When you apply this principle to your business it becomes a serious, progressive business, even if you are working it part time in the beginning. If you stick with it and work part time instead of spare time, you will get there. Daily action is how a successful business grows, even if you have to work it part time. The daily action must be income producing action. Keep keep thinking in marketing mindset and have sharing materials with you at all times. Talk with people, use marketing materials, follow up on interest, then help your new distributors do the same. Make a plan and work your plan every day. Can you believe it? Another year has passed. This is one of my favorite times of the year. This is the time to spend reflect on the past year and make plans for the new year. January is one of the best months of the year for finding new business associates. It is the beginning of a new year and it is the time people decide to change things in their life. For many people, it is a time to begin building a business that can change their life from one of making ends meet to one of abundance. They start the new year off making resolutions. I’m not one for New Year’s Resolutions. People usually don’t take those seriously, however, I am a firm believer in setting goals and making action plans to achieve those goals. I generally begin by thinking about the different things that have happened in the year to this point but also in the years prior in my Young Living career. Reflecting on both the good things that happened and things that weren’t so good. Don’t spend much time on the things that weren’t so good but just enough time to take note of anything you learned or ways you can improve in the future. Not only is it important to be regularly analyzing things and improving as you go, it is also important to celebrate the successes of the previous year. Celebrating is really important because it sets a success energy that attracts more good things. Reflecting on the progress you have made builds confidence. When I look back on the girl who was terrified to be a leader, I am amazed at how far I have come. It always gets me choked up as I write and reflect on how I have changed. Network Marketing is the best business for personal growth. After you have finished reflecting on the previous year, you can make a plan of action for the next year. What will you do to increase your business? How will you improve on your marketing skills and what will you do to implement. Think about where you want to be at the end of 2016. Write that down. Then make a list of all the things you plan to do to get there. Is Your Business Missing This Important Ingredient For Success? One thing I have learned in over 20 years in the network marketing profession is that you need to have an ongoing program for personal development. There are many reasons this is important. In the beginning of your network marketing career you need to learn and build confidence. The world is always changing. There are new tools, technologies and new things happening. You need to keep learning and applying the things you learned to your life and your business. Another are that personal development helps is motivation. Whenever I feel unmotivated I like to put on an audio book and listen to some of pearls of wisdom. Jim Rohn has always been my favorite but there are lots of good, inspiring books and audios. Here is a partial list of my favorite books and audios. I have many of these in both book and audio form. I recommend having books in tablet or Kindle for times when you are waiting. You should be able to find most of these books on Amazon. Law of Attraction – Michael Losier (book and courses) The courses are AWESOME! 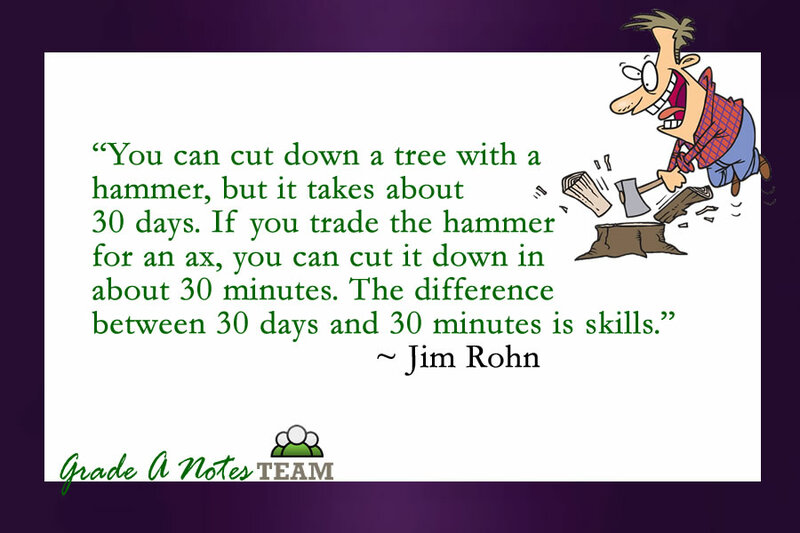 Are You Sharpening Your Skills? Leaders are readers and readers are earners. Even distributors who are already very successful still continue to read books, listen to audios, take online training courses and go to seminars and workshops to sharpen their skills. If you would like a full time income in Young Living, you need to think and act like a professional. Professionals are always sharpening their skills. Are you sharpening yours? In the beginning network marketing can feel a little out of your comfort zone. If you spend a little time every day reading and listening to audios. Your comfort zone will expand. Attend events, seminars and workshops and you will sharpen your skills even more. One way to sharpen your skills is to hang around people who are successful in the business. Observe what they do. Listen when they speak. Follow them on Facebook and other social media and observe how they connect with people. Pay attention. You can learn a lot from other leaders in Young Living. Keep up with things that are going on in the company and with anything that affects your business. It’s no different than any other profession like accountants, lawyers, people in the medical profession, hair stylists, etc. You have to keep up with any changes going on. There are always changes. There are new ways to market and promote your business. Eighteen years ago, when I began building my Young Living business, we did not use social media. Today it is a big part of both business building and training downline. Times change. Have fun learning, growing and sharpening your network marketing skills.